After 15 years of effort, China finally sees the light at the end of tunnel in its endeavor to join the World Trade Organization (WTO). MOFTEC Minister Shi Guangsheng meeting with WTO Director-General Mike Moore in Shanghai. The 18th Conference of the WTO China Working Group, held September 17, Geneva time, passed all legal documents of China joining the WTO, putting an end to all work of the WTO China Working Group. The multilateral legal documents passed at the meeting will be submitted to the WTO Ministerial Meeting to be held in Doha, Qatar, November 9-13. If nothing untoward occurs, China will be accepted as a WTO member in November. So far, it can be said that China's WTO accession is a foregone conclusion. The last organizational procedure is that the protocol needs to be passed by the National People's Congress (NPC), China's supreme legislative organ, before it finally takes effect. If it is passed after deliberation, China will formally become a WTO member in 30 days. Chinese Minister of Foreign Trade and Economic Cooperation Shi Guangsheng said WTO entry is an event of great historical significance in China's opening up to the outside world and modernization drive. The event itself fully reflects the determination of the Chinese Government for deepening reform and furthering the opening up, as well as the proactive pose of China participating in economic globalization and integration into the world economic mainstream. Gao Yan, press spokesperson of the Ministry of Foreign Trade and Economic Cooperation (MOFTEC), said that the end of China's WTO negotiations is the result of joint efforts between China and WTO members. This outcome will benefit both China and all the other WTO members, because China's WTO entry will not only boost China's economic growth, but also promote the economic development of other WTO members. China joins the WTO as a developing country, and it will make unremitting efforts to safeguard the interests of developing countries, as it has always done. In this way, it will make due contributions to the establishment of a truly just new international economic order. Long Yongtu (right), China's chief WTO negotiator, and Chairman Pierre-Louis Girard (left), at the press conference following the 16th meeting of the WTO China Working Group. It was an important moment in the history of the multilateral trade system when China completed its WTO negotiations, said WTO Director-General Mike Moore at the end of the last meeting of the WTO China Working Group. This is the result of international economic cooperation, and with the addition of China, the WTO will advance another big step toward its goal of becoming a true global organization, remarked Moore. Pierre-Louis Girard, the Swiss trade representative, has been president of the WTO China Working Group for 14 years. He said, "I hope China can be formally accepted as a member of the WTO in the near future. The result of China's WTO entry negotiations conforms to WTO rules. During the 15-year process of talks, representatives of all nations not only persisted in principles, but also creatively solved some special problems." European Union's Trade Commissioner, Pascal Lamy, extended his congratulations to China's accomplishment of the WTO negotiations. Lamy said that in the current difficult period, when the multilateral trade system faces a challenge, the completion of China's WTO entry negotiations has brought about a hope as well as a "confidence badly needed." He also stressed that China's entry will enable the WTO to become a genuine global organization. A U.S. trade representative expressed congratulations for the success of the China Working Group. He told the media at the end of the China Working Group meeting that China's WTO entry would assist Chinese, U.S. and global economies. The Thai trade representative, while delivering a speech at the meeting of the China Working Group on behalf of ASEAN (Association of Southeast Asian Nations), said ASEAN felt most happy at the return of China to the multilateral trade system. 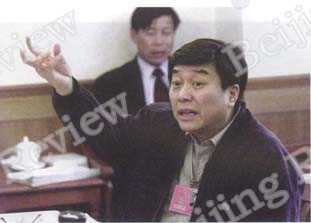 He also expressed his admiration toward the dogged spirit the Chinese delegation displayed in the "15-year long march." He said that ASEAN, which has established long-standing political, economic and social ties with China, is very glad that it can cooperate again with China in the WTO. According to a vice-chairman of the U.S.-China Trade National Committee, all the 250 member companies of the committee hope China can join the WTO. Farmers also support China's WTO entry, because it will mean a considerable portion of American farm products can go to China's markets. Steve Van Andel, chairman of the U.S. Amway Corp., who has recently taken the office of chairman of the American Chamber of Commerce, believes that China's WTO accession will enhance the confidence of American companies in investing in China. He predicts that more American companies, including small and medium businesses, will start business in China. Charles Powell, chairman of the British-Chinese Trade Association, delivered a speech at the Fifth China International Fair for Investment and Trade. He said that China's WTO entry would become the most important trend in international politics and economic news. He believes that China's WTO entry will bring about enormous opportunities to the world, as well as to China itself. A representative of the United Nations Conference on Trade and Development said China is still a major target of world investors. Subsequent to its WTO entry, China will attract more foreign direct investment, most of which will come from Western Europe and North America. The Swedish Trade Minister Leif Pagrotsky announced that China's WTO entry is not only of "great significance" for world trade development, but will also promote the "prosperity and stability" of the Asian region. The British Financial Times published a commentary on September 19, saying China's WTO entry is good news because it will greatly benefit global economy. The commentary said that at the crucial moment when global economy is on the brink of recession, the trade opening to China - a country with huge potential of economic growth - would stimulate the development of global economy. The Morocco newspaper Economist published an editorial on September 19, saying that China's WTO entry is a major international event that will change the setup of world economy. China's WTO entry will enable the WTO to become a "genuine worldwide organization" and be a great driving force for the development of the entire world economy. When China's WTO entry has become a foregone conclusion, will the country's rise threaten other countries? Chinese leaders have solemnly expressed on a number of occasions that China will strictly abide by WTO rules and earnestly fulfill its pledges. In accordance with its own level of economic development, China will make active contributions to strengthening the multilateral trade system. Chinese Premier Zhu Rongji said at the China Economic Forum of the Sixth World Chinese Entrepreneurs Convention recently held in Nanjing, "China will soon join the WTO. We will abide by our pledges, further open the domestic market and expand the opening in industrial and geographical terms. We will propel, step by step, the opening of the service sector, including finance, insurance, telecom, trade and tourism, and actively explore new ways and means in utilizing foreign capital." An NPC deputy discusses draft Amendments to the Law of the People's Republic of China on Chinese-Foreign Equity Joint Ventures. 1. China is to treat each WTO member equally. All individuals and organizations involved in foreign investment, including individuals and organizations that have not invested or registered in China, will enjoy at least the same treatment as Chinese enterprises regarding the rights of trade. 2. China is to abolish the practice of double-track pricing as well as different treatments for domestically sold . goods and export goods. 3. Price control will not aim to provide protection to domestic manufacturers and service companies. 4. China is to modify existing domestic legislation and draft new laws in a unified and effective manner strictly in line with the WTO Agreement, so as to meet requirements of the WTO Agreement. 5. Three years after its WTO entry, except for a handful of cases, all enterprises will have the right to import and export goods and conduct trade within the customs territory. 6. Farm products will have no export subsidies in any form. After China fulfills all its pledges, its average tariff of farm products will drop to 15 percent, while tariffs of industrial goods will drop to 8.9 percent. Subsequent to China's WTO accession, foreign companies involved in services will be allowed to establish equity joint ventures in China, which, no longer limited in number, can provide services in some cities. Five years after WTO accession, foreign financial institutions will be allowed to provide Renminbi services to all Chinese customers. Foreign insurance companies can set up non-life insurance subsidiaries or joint ventures in China, and foreign businesses will be allowed to establish solely foreign-owned subsidiaries. The Seventh International Fashion Culture Dalian Forum - China after WTO accession and international fashion trends. The North China Pharmaceuticals Group takes a forward position in world pharmaceutical science and technology. It has built an international level gene engineering base. To suit the needs of joining the WTO, China has been revising and improving laws and regulations involving foreign trade and economic cooperation. It is expected that by 2010, a legal system of market economy in conformity with China's national conditions will take shape. According to Zhang Yuqing, director of MOFTEC's Department of Laws and Regulations, there are numerous decrees, regulations and rules that need to be revised for the sake of China's WTO entry. More than 2,000 articles of regulations need to be revised one by one. 1. The balance of income and expenditure in foreign exchange. As the WTO forbids the use of the balance of income and expenditure in foreign exchange to restrict the imports of enterprises, Article 20 of the Law on Chinese-Foreign Contractual Joint Ventures, which stipulated that contractual joint ventures should deal with the balance of income and expenditure in foreign exchange by their own, and Article 18 Section 3 of the Law on Foreign-Capital Enterprises, which stipulated that foreign-capital enterprises should deal with the balance of income and expenditure in foreign exchange by their own, have been canceled. 2. Local purchase. Regarding the purchase of raw materials, fuel and other materials, in line with the WTO's no-difference principle, Article 15 in the Law on Foreign-Capital Enterprises, which stipulated that under the same conditions, enterprises should give priority to purchase within China, is canceled. According to the revised Article 9 Section 2 of the Law on Chinese-Foreign Contractual Joint Ventures, enterprises can make purchases on both Chinese and overseas markets. 3. Export obligations. Since the WTO forbids a limit on the export of enterprises, the stipulation in Article 13 Section 1 in the Law on Foreign-Capital Enterprises that required foreign-funded enterprises to use advanced technologies and equipment, or have all or major part of its products exported, has been deleted. 4. The report of enterprise's production plans. In accordance with the no-difference principle of the WTO, Article 9 Section 1 of the Law on Chinese-Foreign Equity Joint Ventures, which stipulated that equity joint ventures should report their production and operation plans to their respective competent departments for filing and implementation of the plans as economic contracts, is canceled. The stipulation in Article 11 Section 10 of the Law on Foreign-Capital Enterprises, requiring that foreign-capital enterprises report their production and operation plans to their respective competent departments for filing, is canceled as well. Hu also revealed that China would abolish the three rigid and inflexible rules required of foreign-funded enterprises after its WTO accession, namely, local proportion, foreign exchange balance, and proportion of export. Hu explained that, with the cancellation of the three rigid and inflexible rules, foreign-funded enterprises in China would no longer need Chinese capital to make up a considerable proportion. The Chinese Government will no longer restrict foreign-funded enterprises by means of foreign exchange. And there will be no compulsory requirement for the export of foreign-funded enterprises. American investors are becoming increasingly enthusiastic about investment in China. Hu also pointed out that the Chinese Government would make special efforts to open the service trade sector, which includes finance, insurance, telecom and commerce. But for enterprises engaged in military industry, the field of ideology and traditional industries, such as techniques of cloisonne enameling, the Chinese Government will not open them to foreign investment, either now or in the future. The related department forecasts that with China's WTO accession, the country will further its opening up, which will lead to a new round of foreign investment in China. 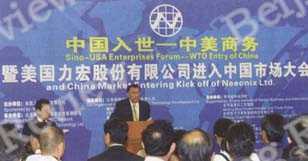 Experts believe that WTO entry marks the full linkage of China with the international community. The Chinese economic system and Chinese policies, laws and regulations in relation to foreign investment will become less ambiguous. This will strengthen the confidence of foreign investors in the Chinese market. Firstly, China's current policies, laws and regulations aiming to attract foreign investment still contain some inappropriate content. For instance, foreign-funded enterprises are required to purchase a certain amount of domestic goods as the input of production. The policy governing the auto industry requires the linkage of the domestic production rate with the tariff rates of imported auto parts, and foreign-funded auto enterprises must upgrade their products and devote efforts to the localization of their products. There are also restrictions for foreign-funded enterprises to purchase imported goods. Now, all these practices will be changed. 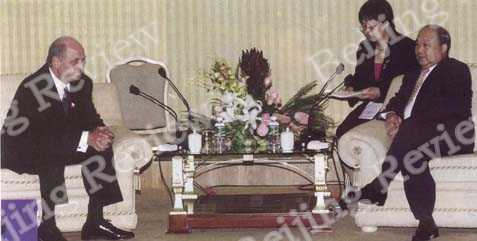 China and EU representatives sign the bilateral agreement on China's accession to the WTO in Beijing, May 19, 2000. Secondly, the current system for examining and approving foreign investment will be reformed to increase the transparency of examination and approval. After its WTO entry, China will regularly report its changes in foreign investment policies to the WTO. It will establish a mechanism for issuing policies related to foreign investment, and designated media will publicize the related policies. Examination and approval of foreign investment will be conducted in accordance with promulgated laws and regulations. The procedures of examination and approval will be simple but effective, with the whole process being open. Thirdly, the implementation of national treatment following WTO entry will exempt foreign-funded enterprises from many problems. This will greatly boost foreign investment in China. The opening of finance, insurance, telecom, commerce, tourism, foreign trade, shipping, construction, education, public health and publishing will quicken in pace. The absolute value and ratio of foreign investment attracted by the service sector will experience an obvious increase, which is expected to push up the total amount of foreign direct investment. WTO entry will push China to gradually adopt universally accepted channels for attracting foreign investment, such as merger and acquisition and securities investment, which will further expand the scale of foreign investment. In a step-by-step way and under the prerequisite of guaranteed supervision, China may gradually allow foreign investors to participate in the A-share market by means of securities investment. According to international practice, more than 10 percent of securities investment in an enterprise is considered a direct investment in the enterprise, meaning the participation in the enterprise's operation. China is one of the founding nations of the General Agreement on Tariffs and Trade (GATT) launched in 1947. After the People's Republic of China was founded in October 1949, Taiwan authorities illegally took China's seat. In April 1984, China obtained the status of GATT observer. In July 1986, China formally submitted an application for restoring its status as a signatory nation of GATT, thus starting the long march of returning to GATT. In September 1986, China began to participate in multilateral trade negotiations of the Uruguay Round of GATT. 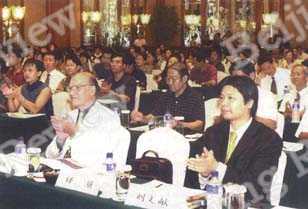 In March 1987, GATT set up a China Working Group, which held its first meeting in October the same year. By the time the 11th meeting was held in October 1992, the China Working Group had basically completed the deliberation of China's economic and trade systems, indicating the beginning of substantial talks on China's return to GATT. In April 1994, China signed the final document of the Uruguay Round and the World Trade Organization Agreement. The signing of the two documents was a necessary condition for China's return to GATT. In November the same year, China proposed to complete substantial talks on the return to GATT at the end of the year, which became a requirement founding members of the World Trade Organization (WTO) initiated on January 1, 1995. Because of the deliberate obstruction of certain signatory nations, the 19th meeting of the GATT China Working Group held in December failed to reach an agreement on China's becoming of a founding member of the WTO. On January 1, 1995, the WTO was formally founded, which completely replaced GATT after one year of transition. In May, talks on China's return to GATT, which had been suspended for five months, resumed in Geneva. On July 11, the WTO decided to accept China as its observer. In November, the Chinese Government addressed WTO Director-General Renato Ruggiero, renaming the China GATT Return Working Group the China WTO Entry Working Group. China's negotiations on its return to GATT thus became negotiations on China's WTO entry. On May 23, 1997, the fourth meeting of the WTO China Working Group held in Geneva reached an agreement on two major articles, namely, the nondiscrimination principle and the judicial review, in the protocol on China's access to the WTO. In August, New Zealand became the first country to reach a bilateral agreement on China's WTO accession. That year, China also signed bilateral agreements on its WTO accession with the Republic of Korea, Hungary and Czech. On April 7, 1998. China's package plan on reducing tariffs, put forth at the seventh meeting of the WTO China Working Group, was generally welcomed in the group. 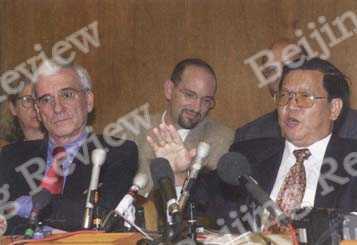 On November 15, 1999, through tiard and intricate negotiations, the Chinese and U.S. Governments signed the bilateral agreement on China's accession to the WTO in Beijing. 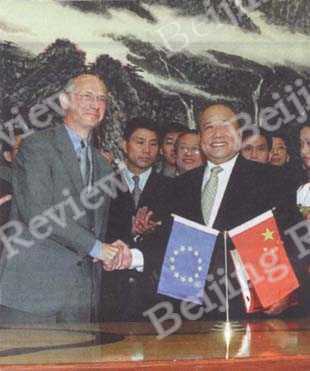 On May 19, 2000. in Beijing, China and EU representatives signed bilateral agreement on China's WTO entry. On June 9-21, 2001, China successively reached comprehensive consensus with the United States and the EU on issues left over in multilateral negotiations in relation to China's WTO entry. The 16th meeting of the WTO China Working Group, held June 28-July 4, reached a full consensus on 12 major issues remained in the multilateral negotiations. The 17th meeting of the WTO China Working Group, held July 16-20, discussed legal documents and appendixes as well as the report of the working group. Finally the drafting of these legal documents was finished. On September 13, 2001. China and Mexico reached bilateral agreement on China's WTO entry. China completed bilateral market entry negotiations with all WTO members. On September 17, 2001, the 18th meeting of the China Working Group passed all the legal documents on China's WTO entry, which also put an end to all work of the China Working Group. The WTO plans to hold the Fourth Ministerial Meeting at Doha. Qatar, November 9-13, which will vote on China's WTO entry.